make a list of (or preferably bring) all medications you are currently taking. keep a diary or journal of what you are eating on a daily basis for a week so the doctor can have an idea of your current nutritional habits. Each patient is required to complete a Welcome Sheet with your contact, insurance and health history information. Please bring your insurance card and photo ID at the time of your visit. Copies will be made. Although Dr Adrian does not accept insurance and is self pay, your insurance information is required in ordering lab tests and ordering medication as benefits may still apply. 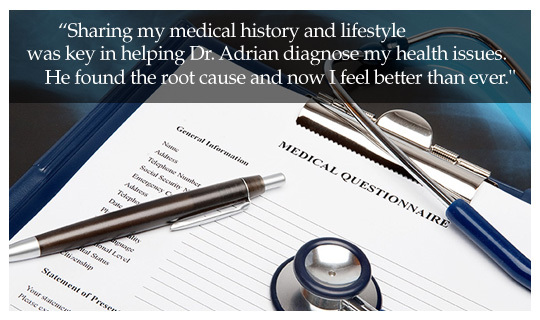 Dr Adrian does not accept insurance and has opted out of Medicare. If patient is eligible for Medicare, patient must complete the Private Contract and Financial Policy before seeing the doctor and agrees NOT to submit any claims for the visit to Medicare or any Medicare Advantage plans. A Medical Release form is available should you need to request records be shared to or from another physician. This form only needs to be completed at the time records release is appropriate. Visit our complementary medical doctor if you are a resident of Hershey, Lancaster, Palmyra, Reading, Chambersburg, Elizabethtown, Hummelstown, York, Annville or Harrisburg, PA.